Do You Remember Hunslet Grange Housing Estate? built exactly fifty years ago. The estate is remembered by many from different perspectives, positive and negative. We aimed to record and present some of those perspectives and link them to contemporary social issues, particularly public housing, community building and social isolation. The documentation that ignited this interesting social history investigation, to build a picture of housing and its changes for people then and perhaps now, still resounds in our society. A short film viewed at the Yorkshire Film Archive, Community Builder (1968), aimed at the construction industry, shows community life in Hunslet before and after the new estate was built. It depicts life on the cusp of change from centuries-old lifestyle in back-to-back housing to a modern and comfortable new complex ( which is how Hunslet Grange was proposed). 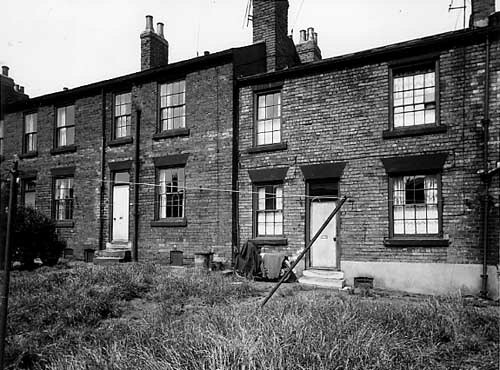 Hunslet Grange, also known as Leek Street flats, was built to replace a large area of terraced housing in south Leeds. The local authority and construction company hailed the development as innovative and modern, as it used new building methods and materials. Certainly, many residents moved from overcrowded terraced houses with shared outside toilets, to brand new flats with mod cons. They soon discovered, however, many serious faults resulting from the prefabricated structure: draught, cold and damp, combined with an electric heating system that was prohibitively expensive for the majority of tenants. After a lengthy campaign by Hunslet Grange tenants for a solution that would improve their living conditions, the flats were demolished in 1983. We have carried out further research, including in the Local and Family History library, the University of Leeds, the West Yorkshire Archives and online. This has resulted in discovering more archive material, particularly photographs and accounts of living in Hunslet Grange, in publications and online. Following on from this, we carried out primary research at Holbeck Elderly Aid’s Memory Cafe, using the film and photographs to spark discussion about housing, communities, then and today. One of the members had lived in a succession of flats at Hunslet Grange (“the Leekies”). 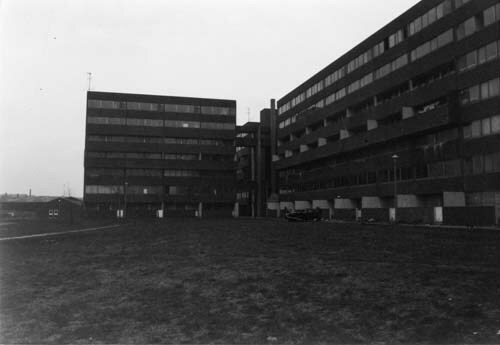 Her memories of happy times on the estate among a supportive and close-knit community contrast sharply with the poor reputation of the estate, as well as with others’ experiences of isolation living in high rise accommodation. There are many similarities with our society today: the social changes that are indications of changing lifestyles; cuts to public services; erosion in our family networks and communities. Some of these things have not changed and people are under a serious strain at times to find suitable homes, which can lead to isolation, homelessness or deprivation of different sorts for all age groups. So: we would like to collect further memories, stories and documentation from people living or connected to the Hunslet Grange flats, or other similar housing estates around Leeds.The material will be collated into a small exhibition planned for display at Leeds Arts University, added to this blog for those interested in local housing and social issues; or who simply want to read the memories and stories that we discover. Previous Post Xin Nian Kuai Le!